Dimensions 0.75 by 8.25 by 9.50 in. German language; Sound recordings for English speakers. Amazon.com description: Product Description: Order das beste Bier at Oktoberfest! Hitch a ride on der Autobahn! Say "Wilkommen" to your neuen deutschen Freunde! Ich mÃÂ¶chte ein Berliner, bitte. Order food with ease. Wie viel kostet der KÃÂ¤se? Ask how much items cost. 2 pap/com edition from Adams Media Corp (November 18, 2009); titled "The Everything Learning German Book: Speak, Write, and Understand Basic German in No Time"
About: Order das beste Bier at Oktoberfest! About: Itâs easy to become intimidated by the prospect of learning a foreign language, and many consider German to be the most difficult of all. 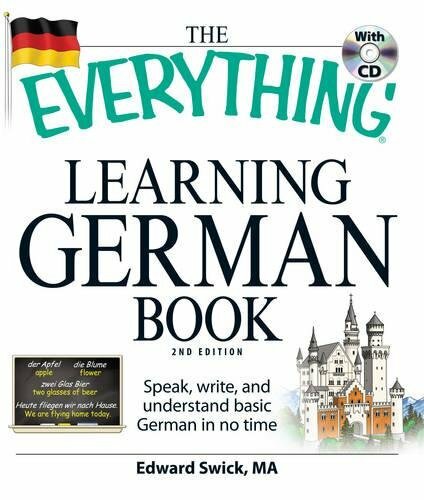 from Adams Media Corp (December 1, 2009); titled "The Everything Learning German Book: Speak, Write, and Understand Basic German in No Time"